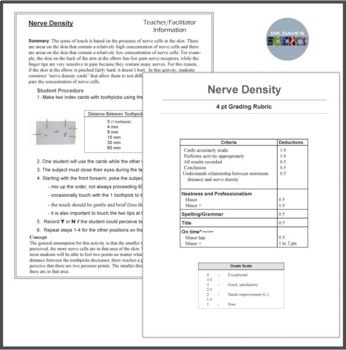 In this activity, students construct “nerve density cards” that allow them to test different areas on the arm to compare the concentration of nerve cells. Areas on the skin that have few pain and pressure receptors (such as the back of the elbow) are not able to detect two pressure points at a larger minimum distance than areas on the skin that have more nerve cells. 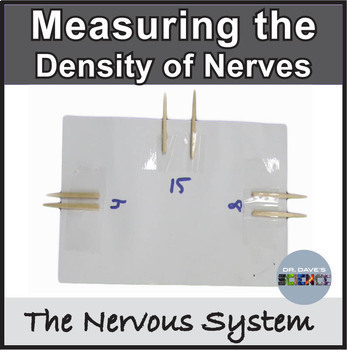 Directions to make the nerve density cards and the procedure to run the activity are provided. 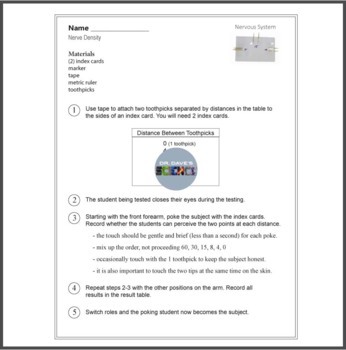 The result table is included and can be a stand-alone assignment or can be incorporated into a student’s laboratory notebook. A grading rubric is also included. This product is part of a Nervous System Bundle. You will save 20% on all nervous system activities listed below by purchasing that bundle. Highest Value - Full Human Body System BundleHUMAN BODY SYSTEM Bundle. You save 25% on the full unit for the Human Body System! Copyright © DrDavesScience. All rights reserved by author, including copyrighted images. This product is strictly for individual use and may not be copied for other teachers. The file itself may not be forwarded to other individuals unless multiple copies have been purchased. The file may not be edited or modified in any way and may not be uploaded onto any digital or online file sharing platform unless permission has been granted by DrDavesScience.